"Americans who eat a diet high in sodium and low in potassium have a 50% increased risk of death from any cause, and about twice the risk of death from heart attacks. In a traditional, largely plant-based diet, potassium content is high and sodium content low. As foods are processed, typically sodium is added and potassium is removed, reversing the sodium-potassium ratio. Encouraging consumption of unprocessed, potassium-rich fruits and vegetables is the safest and preferred pathway to increasing potassium intake." Honestly, there are so many medical articles that are published every week, it's tough to choose the ones that really matter to our everyday lives. After looking through last week's news--here are the stand-outs that IMHO are worth paying attention to. It's research you can put to use, right now. I know I'm going to! 1. Here's what you need to know: If you eat a diet that's high in sodium, highly processed, and mostly comes from restaurants, your local grocery store deli or take-out counter or fast food joints, you significantly increase your chances of death, compared to those who eat a diet that's low in sodium, and high in fresh unprocessed food. Plain & simple! Doesn't it just make sense to eat lots of plants & cook your own food? The Sodium-Potassium ratio matters! In a recently published research study, in the Archives of Internal Medicine, the folks with the highest ratio of sodium to potassium had the highest risk of death from all causes, including heart disease. Who wants that? So where's all that sodium coming from? Restaurant foods, packaged foods, canned foods, cheese, processed meats, breads, soups, fast foods, and pastries--they all have a lot more sodium than potassium in them. My typical green smoothie is made with 4 cups of kale (1200 mg), 1 cup of carrots (410 mg), 1 orange (313 mg), 1 kiwi (522 mg), and 1 cup of frozen blackerrries (211 mg) comes to a grand total of 2656 mg of potassium. No wonder the famous DASH Diet to stomp out high blood pressure recommends eating 8-10 servings of fruits & vegetables everyday. It's all that potassium, baby! And the benefits of the DASH Diet have extended to preventing memory loss. Just check out the Cache County, Utah study where the results showed that those seniors who were closest in following the DASH diet, had the slowest decline in cognitive functioning--while the participants in the lowest quintiles had the most rapid decline in congnitive functioning. Why is this study so important? It's the first one to look at a nationally representative sample of Americans, and examine the association between mortality and how much potassium & sodium we are consuming. The researchers used top-notch statistics--analyzing the data from the the CDC's Third National Health and Nutrition Examination Survey (NHANES III)--which collected data about the nutritional & health status of 12,267 U.S. adults for 15 years, from 1988 to 2006. What can we take home from this study? The higher the sodium to potassium ratio, the higher the risk of cardovascular disease--and the higher the sodium intake, the higher the higher the risk of all-cause mortality. Increase your potassium levels with whole foods that are also low in sodium, such as leafy greens, like spinach & collards, grapes, blackberries, carrots, potatoes, & citrus fruits. The CDC says, "People who reduce their sodium consumption, increase their potassium consumption, or do both, benefit from improved blood pressure and reduce their risk for developing other serious health problems." Read labels carefully--eat out with caution--chef's like their salt shakers. It makes food taste good! And you won't find nutritional labelling on restaurant menus. Rip Esselstyn's Rule of Thumb: Limit the amount of sodium per serving to the number of calories per serving, or less. You'll be shocked when you carefully look at the sodium/calorie content of processed foods. It's not so easy to lower sodium. "The major implications of our findings are that a diet balanced in both micronutrients (sodium & potassium) is important. People should try to reduce sodium in particular by consuming less processed food, but also they should increase potassium intake, and this is easily done by eating more fruit and vegetables and dairy products, which are a good source of potassium and low in sodium. This is nothing new: a healthy diet is good for your health. We found that potassium does matter." Is it really the sodium-potassium ratio that's responsible for such a positive health benefit in this study--or is potassium just a marker for a diet that's high in fresh vegetables and fruits--that brings with it a number of benefits, like vitamins, antioxidants, polyphenols, and fiber? Hmm! "[O]ur findings, based on data from a large representative sample of US adults, showed that serum alpha-carotene concentrations were inversely associated with the risk of death from all causes, and death from cardiovascular diseases and cancer. These findings support increasing fruit and vegetable consumption as a means of preventing premature death." The older you get--the harder you have to work. Sorry. That's just how it is. This article couldn't have come at a more perfect time for me--now that I've set up an appointment with a trainer to design an at-home routine I can do 2-3 times a week. My motivation is for bone health--but I won't turn down bigger muscles. Hot Off The Press: Older Adults Have to Exercise More to Maintain Muscle Size. Bickel, C. Scott et al. "Exercise Dosing to Retain Resistance Training Adaptations in Young and Older Adults," Medicine and Science in Sports & Exercise 2011 Jul;43(7):1177-87. This is the first study to "suggest" that adults over age 60 need more weight-training sessions than 20-35 year olds need--if they want to maintain all their hard-won muscle mass gains they get from strength-training at the gym (or home). Once a week just won't cut it! If you cut back your weight-training to one day a week, your muscles will start to shrink. Sorry to break it to you. 20-35 year olds just don't have to work as hard. They can maintain their muscle mass gains with one day a week at the gym. They can even cut their repetitions down from 3 sets, to one set, strength-train only once a week--and still maintain their muscle mass. The good news is that both young & old can maintain their muscle strength (not to be confused with muscle mass) with a once a week weight workout. But, strength isn't enough, if you want all the health benefits of resistance-training as you age. It pays to work out 2-3 times a week & build your muscle mass, too. It will help maintain your glucose balance, your fatty acid metabolism, as well as your bone & joint strength! Just do it! 31 adults were 60-75 years old. 39 adults were 20-25 years old. No one was obese, or had musculoskeletal problems. No one had resistance-training experience in the past 5 years. Phase 1 Progressive Resistance Training-16 weeks: Three progressive resistance-training exercises were performed 3 times a week, for 16 weeks. Everyone did 3 sets of each exercise--leg extensions, knee extensions, & squats. All 70 participated. Phase 2 Detraining/Maintenance Training-16 weeks: After the 16 weeks of muscle-building, the groups were divided into 3 groups. One group did no exercise at all. One group cut their training down to once a week, but still did the three sets of the three exercises. One group cut their training down to once a week, but only did one set of the three exercises. How did the researchers measure muscle mass & muscle strength. To determine changes in muscle mass each subject had 4 muscle biopsies performed (ouch!) --baseline, after the training, after follow-up periods of 16 weeks, and 32 weeks. Each participant also had their muscle strength measured with load-lifting tests. The study took place at the University of Alabama at Birmingham, a joint effort of the Depts. of Physical Therapy, Surgery, Physiology & Biophysics, Geriatric Research, & the Birmingham VA Medical Center. For those over age 60, once-a-week strength-training will maintain muscle strength, but it will not maintain muscle size, once it has been achieved. The researchers demonstrated that a once-a-week resistance-training workout can maintain muscle strength up to 8 months in young & older adults. But, adults over age 60 need more frequent resistance-training workouts to maintain any muscle mass gains they achieve from weight-training. "We are not advocating that people only train one day a week indefinitely, but we do believe such a program can be effective during temporary periods when it is difficult to maintain a consistent, intensive exercise regimen, several days per week." Lead author, Marcas M. Bamman, PhD. "The positive health benefits of increased muscle mass among older adults extend well beyond muscle performance, to include glucose homeostasis, fatty acid metabolism, aerobic capacity, and bone & joint health. The causes of autism still remain a mystery. Is it genetic? Is it environmental? As the number of children with autism has increased in recent years, researchers can't pin down a single, clear cause. Is it caused by parental age, prenatal viruses, infant vaccines, environmental toxins, or even a lack of vitamin D, as some researchers have suggested? Maybe there hasn't been an increase in cases at all. Some researchers suggest that the increase in numbers is just based on a loosening of the diagnostic criteria? Back in 2008 I posted about the work of some of the country's top environmental researchers, who were betting that autism might be fueled by the endocrine disruptors that come from everyday chemicals. Bisphenol-A (BPA) that was commonly found in moldable plastics & is still in the linings of cans, along with phthalates found in carpets & flame-retardants have been implicated. Click here for that post. Two weeks ago, I was up early on a Saturday morning & caught an interview on National Public Radio's Living on Earth broadcast with Dr. Martha Herbert. She's a professor of neurology at Harvard Medical School and an expert in autism research. She explained the findings of the latest autism study that was published in April 2011 in the Archives of General Psychiatry This new study found that the genetic causes for autism have been overestimated--and the environmental causes have been seriously underestimated. Definitely something we all need to consider carefully. To read the complete interview transcript, click here. GELLERMAN: So let's look at the methodology that the researchers used [in this study]- they studied twins. HERBERT: Because twins are in the same family and they share at least some genes. But identical twins share all the genes and fraternal twins don’t share all the genes - they have maybe 50-50. HERBERT: Yes, that’s what people have usually said. GELLERMAN: So these researchers studied, what, about 192 pairs of twins? GELLERMAN: What did they find? HERBERT: They found that actually there was more concordance than expected in the fraternal twins, and less in the identical twins. HERBERT: That means that if one is autistic, then the other is autistic. So usually it has been that 60-90 percent of the identical twins were both autistic, and 0-10 percent were both autistic if they were fraternal twins. And that led people to think that this was, by in large, very, very strongly, a genetic disorder. But to have there be so much match-concordance - in the fraternal twins, and not so much in the identical, suggests that there’s shared environment. What they calculated was that the risk for autism was 38 percent from genetics and 58 percent from the environment that the twins shared. GELLERMAN: So it’s a very low number in terms of genetics and very high in terms of environmental issues. HERBERT: Yes, which is really different from what everybody’s been saying up until now. GELLERMAN: So what kind of environmental factors could we be talking about? HERBERT: Well, there are lots of environmental factors that people have been talking about and trying to do research about. It ranges from chemicals to nutrition to exposures like to living near a freeway – many, many different types of factors. GELLERMAN: Are there any suspects that perhaps stand out from the crowd? HERBERT: There are a number of chemicals that it’s a good idea to watch out for. Bisphenol - plasticizers that make plastics moldable. Flame retardants - flame retardants in baby pajamas and in bedding that were not tested for the baby urinating in the bed, which then makes the chemicals float around in the air that the baby then breathes in. Pesticides - be really careful about spraying your house. Find more natural ways of avoiding pest exposure. Pesticides in food - try to eat organic if possible. Look under your sink and clean out a lot of the products, which have long lists of chemicals that you can’t pronounce. There’s lots of ways of cleaning your house with simple products, with vinegar and water and baking soda, and things that are not going to cause problems, that may show up now or later. GELLERMAN: How does this research help us, and what happens next in autism research? Now, looking back, this is not the trimmings. This is not the icing on the cake, it’s the cake. 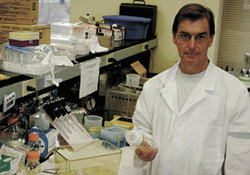 Dr. Bruce Hollis' NIH Vitamin D in Pregnancy Study is Now Complete. High Dose Vitamin D (4000 IUs) Significantly Improved Health & Outcomes for Moms and Babies. And Harvard Researchers' Theory of a Vitamin D - Autism Connection. "I'm telling every pregnant mother I see to to take 4000 IUs and every nursing mother to take 6,400 IUs of Vitamin D.
I think it is medical malpractice for obstetricians not to know what the Vitamin D level of their patients is. This study will put them on notice." If you are pregnant, planning to become pregnant, or know someone who is pregnant--do them a huge favor and pass this information on to them! OK, I admit it. I'm a wild and crazy cheerleader for Vitamin D. Anyone who is paying attention knows that unless you are regular sunbather (and who is? ), or you're religiously taking a Vitamin D supplement of at least 2000 IUs a day, you are probably woefully deficient in this important hormone--that we all think of as a vitamin. Why does Vitamin D have such an important influence on our health? Since the Human Genome Project, we now know that Vitamin D is responsible for regulating over 10% of our genes. It's not just responsible for skeletal health--but cells throughout the entire body are dependent on Vitamin D in order to work properly. Which is exactly why Dr. Bruce Hollis decided back in 2000 to figure out how much Vitamin D pregnant women and babies optimally need! When it comes to a developing fetus, and a fast growing infant--there is no more important time to make sure that all our cells and systems are getting exactly what they need to work & develop properly. I'm talking about brain function, nerve function, immune function, skeletal function--all dependent on adequate supplies of Vitamin D--including its important role in preventing 14 types of cancer, heart disease, autoimmune disease, diabetes, inflammation/inflammatory diseases, infection, and osteoporosis. Yep, I'm a Vitamin D cheerleader! Pregnancy and breastfeeding is a unique time in development when getting enough Vitamin D has a direct impact on both the mother and baby's bone health, cardiovascular health, immune function and glucose metabolism. Research continues to mount about its important role in brain development and in preventing brain disorders. Recent theories (Harvard scientists publishing in Jan. 2010 in Medical Hypotheses) speculate that Vitamin D deficiency might be linked to autism--and adequate supplementation might have a role in preventing it. So, when I heard about the exciting results of Dr. Hollis' just completed NIH Study on the Evaluation of Vitamin D Requirements During Pregnancy, I couldn't wait to blog about it. Drs. Bruce W. Hollis and Carol Wagner just presented their study results at the 14th International Workshop on Vitamin D, in Bruges, Belgium--and I'm doing my part to get the word out. It will probably take years before the academic pediatric and obstetric associations modify their recommendations to reflect the study's high level of supplementation. In fact, before beginning this study, Dr. Hollis had to first get FDA approval in order to use 4000 IUs of Vitamin D as an "investigational drug". In November Hollis sent his findings to the pediatric academic associations--so we'll have to wait & see if their Vitamin D guidelines are changed as a result. Just so you know--Dr. Hollis is one of the world's leading authorities on Vitamin D--with a keen interest in making sure pregnant woman and infants get a "full supply" of this critical vitamin. 600 pregnancy women were enrolled from January 2004-December 2008--including African Americans, Hispanics, and whites. Because dark pigmented skin prevents adequate absorption of Vitamin D from sunlight--it was important to include multiple races in this study. For the details of the study proposal click here. Vitamin D supplementation began at 12 weeks and continued until the end of the pregnancy. The control group took the usual standard recommendation of 400 IUs; one group took 2000 IUs of Vitamin D; one group took 4000 IUs of Vitamin D--which is 10 times the recommended amount. How Did Increased Vitamin D Benefit the Moms & Babies? Women taking the 4000 IUs increased their vitamin D level by about 50%--to a normal level of 40 ng/mL. Premature births and premature labor were reduced by 50% at both 32 and 37 weeks in those taking the highest levels. Fewer babies were born "small for dates"--which means smaller than expected for the time spent in the womb. This is a little-known pregnancy complication of taking inadequate amounts of vitamin D.
Women in the 2000 & 4000 IU groups reduced their number of infections throughout pregnancy by 50%: including respiratory infections, like colds and flu, as well as fewer vaginal and periodontal (gum) infections. The common complications of pregnancy like gestational diabetes, increased blood pressure, and pre-eclampsia were reduced by 30%. The babies born to moms getting the highest vitamin D levels had fewer colds and less eczema. The 50% drop in maternal infections for moms receiving 4000 IUs of Vitamin D did not surprise Hollis at all. Vitamin D is in charge of firing up our "Rapid Response" immune function. When we get enough Vitamin D--it works optimally--quickly nipping infections in the bud. According to Dr. Michael Holick, moms who got adequate Vitamin D during pregnancy reduced the risk of wheezing disorders in their children by 61%. Vitamin-D deficient infants will never attain their genetically preprogrammed bone density or height. That's one scary thought! A Boston study looked at 40 mother-infant pairs--the moms took the recommended 400 IU/day Vitamin D in their prenatal vitamin and drank 2.3 glasses of milk a day--at birth, 76% of moms were Vitamin D deficient--81% of newborns were deficient. Exactly what Dr. Hollis found out in his study. Higher Vitamin D levels decreased the likelihood of preeclampsia, and reduced the need for C-sections. Exactly what Dr. Hollis found out in his study. Breast-feeding moms need to be vigilant that their babies are getting enough Vitamin D. The breast milk of moms who are not getting enough Vitamin D has a paltry 25 IUs of Vitamin D per liter (1 quart, 2 ounces). Not even close to the 400 IUs their babies need. It would take 4000-6400 IUs/a day for a breast-feeding mom to get enough Vitamin D into her breast milk to meet the baby's requirement of 400 IUs a day. But according to Holick, until more studies are done, "it's not something we're recommending." Hopefully, we'll be able to in the near future." In the meantime--breast-feeding moms need to make sure their babies are getting 400 IUs/a day of a Vitamin D supplement. Infants exclusively breastfed, without sun exposure or supplementation have an increased risk of developing Vitamin D deficiency, unless their moms have more than adequate supplies of Vitamin D.
Darkly pigmented infants--living in Northern latitudes--are more at risk because dark skin only absorbs 50% of the sun's Vitamin D.
Recent studies show that in order for the Vitamin D in a mom's milk to reach adequate levels--mom's need to supplement to a level of 4000-6400 IUs of Vitamin D.
Drs. Hollis & Wagner are currently conducting a NIH trial on the effect of High Vitamin D on breastfeeding moms & their babies. The results of their pilot trials were shocking. Only the infants whose mothers supplemented at the highest level--6400 IUs--had Vitamin D levels equivalent to those of infants who received 300 IUs/day of Vitamin D drops. Hollis & Wagner strongly advocate for moms to supplement at high levels, rather than relying on infant supplement drops. Why? Because it is the only way to insure that both the mother & baby are adequately supplied. The Current Catch-22 Situation: Until the large studies on high-dose Vitamin D for breastfeeding are completed, no one can officially recommend high-dose Vitamin D for breastfeeding moms. Which means, in the meantime--infant supplementation is in order. American Academy of Pediatrics now recommends 400 IUs for infants. Gold standard: pregnant & nursing moms need to get an inexpensive 25-hydroxy-Vitamin D level test to see just how adequate their Vitamin D supply is. It's the only way to know! To read an excellent review of scope of Vitamin D in pregnancy & lactation, click here. Breastfeeding Medicine 3(4):239-50, Dec. 2008. Wagner, CE, Taylor, SE, Hollis, BW. "Does Vitamin D Make the World Go 'Round'?" Remember, this is all theory right now. But the theory recently came to my attention through a forthcoming paper in Medical Hypotheses 74:102-106, January 2010, "Environmental risk factors for autism: Do they help cause de novo genetic mutations that contribute to the disorder? ", by Dennis Kinney, et al. When five Harvard researchers publish a hypothesis--it's worth reading. And they are not the first to speculate about this connection. For an easy-to-understand version of this theory, click here to read: "What If Vitamin D Deficiency Is A Cause of Autism? A few researchers are turning their attention to the sunshine vitamin as a culprit, prompted by the experience of immigrants that have moved from their equatorial country to two northern latitude locations. Scientific American News. April 24, 2009. A number of De Novo (meaning, "new" not copied from the parents) genetic mutations are risk factors for autism. The Harvard researchers theorize that environmental & urban chemicals like mercury, cadmium, nickel, trichloroethylene, and vinyl chloride might trigger the genetic mutations responsible for autism. It turns out that children from areas exposed to higher levels of these contaminants have significantly higher rates of autism than children living in areas of low exposure. Vitamin D plays a tremendous role in repairing DNA damage--and protecting against oxidative stress--which is a key cause of DNA damage. Vitamin D deficiency can lead to higher rates of mutation and impaired DNA repair--conversely, adequate Vitamin D appears to prevent DNA mutations. Here's the vitamin D connection: Higher rates of autism exist in areas where there is less sun, in areas of higher precipitation (lots of rain)--where people spend more time indoors, and where Vitamin deficiency is highest. The Centers for Disease Control found higher rates of autism for children living in northern latitudes (less sun) compared to those living in southern states. Recent reports surfaced about the high incidence of autism found in the children of new Somali immigrants (dark-skinned Africans) who moved to northern latitude cities in Minnesota and Sweden. In Minnesota, these rates are 2 to 7 times greater than the rates for non-Somalis. Autism was unheard of in these families when they lived in Africa--and only surfaced after moving to Minnesota and Sweden. Dark skin makes Vitamin D absorption extremely difficult at northern latitudes--added to which many of these Somalis are Muslim, and the women are wearing burkas. The Harvard researchers cite the work of Cannell, Chatterjee, and Bao that demonstrates how adequate Vitamin D has the ability not only to prevent genetic damage, but to repair damage that has occurred. They recommend that we begin controlled clinical trials of Vitamin D supplementation for adults living in areas where Vitamin D deficiency is prevalent (U.S. & northern Europe)--who are planning to conceive children in a few years. In other words--if you are considering having a baby any time soon--prevent potential problems now--start supplementing with Vitamin D.
For another perspective on the Vitamin D/autism connection, read Dr. John Cannell's (one of the originators of the theory) review of the Medical Hypotheses article. Click here. More on what Dr. Bruce Hollis has to say about the importance of Vitamin D for adults--how it affects autoimmune diseases like rheumatoid arthritis, multiple sclerosis, cancer, bone pain and heart disease. In the meantime, how much vitamin D does Dr. Hollis take? He's an international expert on Vitamin D who lives in sunny Charleston, SC. 4000 IUs a day. This consistently gets his blood levels up to around 60 ng/mL. After years of study he has never seen any adverse effects with higher doses of Vitamin D, as long as the level does not exceed 10,000 IUs/day. He strongly believes that sufficient levels of Vitamin D are what we would naturally have if we could be fully sun-exposed--and he's found this level to fall somewhere between 50 ng/mL to 70 or 80 ng/mL. Current recommendations now put the normal level anywhere over 30 ng/mL. Do yourself a favor and get your vitamin D level tested. Everything You Ever Wanted to Know About Vitamin D from the Expert, Dr. Michael Holick. How Much Do We Need? Why Is It So Hard to Get Enough? What About Breast-Fed Babies? Why Is It So Important for Good Health?